I am hosting my own site and blog now. It has been my desire to create a site that has better content, news, information and benefit to the Autodesk Design and Manufacturing community. More storage and flexibility was required. This site will be discontinued over time. This option costs me SOOOOO much time every day. Well, that and not saving valuable changes to my template. So in tune with James’ famous PLEASE STOP posts, I’ll post some of my own now and then, mostly for my own sake. Perhaps I’ll save a few of you some frustration. Editing a style by selection through a Right Click Context menu is such a cool, convenient option, right. So much so, that faced with a large amount of style tuning, I’ll pick it anyhow. JUST STOP!! Break the habit. Here’s the thing. It all revolves around this magic button. Once you try skiing, You’re hooked. Yamitsuki means hooked; ni naru means to become. Repeat this over and over all day. My boys will work with it until they can repeat it on queue. Remember these are such a useful supplement. They helped me a lot. Bonus study. Can anyone figure out what this kana word is? Can you replace it in out study sentence? Autodesk sent out invitations to a webcast Thursday, February 25, 2010, presenting the first in a 3-part series discussing laser scanning technologies for infrastructure projects. The 1 Hr event kicks off at 10:00 hrs PST. Everything in the world seems to point into Google Earth. The problem is that we receive GE KML files coming and going. Client’s send them to us, we send them to crews, we send them to clients and contractors. Generally these get sent to everyone. 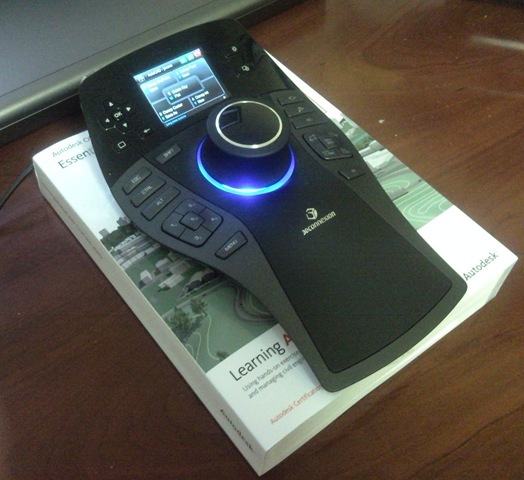 I found that everyone seems to have converters for Google Map to Google Earth, Excel to GE, ESRI SHP to GE, you name it. I bet my wife has something that will export one of her Facebook games to GE. I figured there were numerous options when my VP asked for something to export a KML file to ascii LAT/LON, or even to UTM/SP Grid. I think he’ll take it any way he can get it. I know he’s looking at ME to write it in .NET, but my working with Tekni takes all my personal time, so I need to head this off quickly. “You know it will cost you more for me to code and debug it, than if we outsourced it. “ I said, “But I know a guy who’ll do it for next to nothing”. Yeah… the look I was getting said he wasn’t too hip on paying anything beyond my salary. “Ok ok, let me go online and try to find something, then we’ll talk about outsourcing”. These folks have a slough of data outputs. 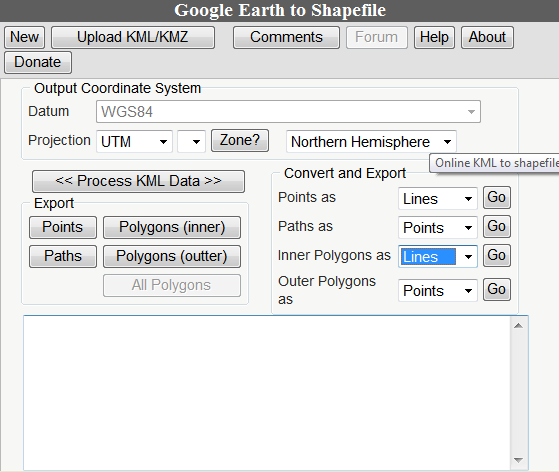 You can Import the file, or paste the KML string. It’s online PHP, and convenient. The output formatting is a bit caste, but very little rework will be needed. It’s free, and there are many options, as well as other programs. It got me off the hook, and it might help you. As for using GE with Civil, I still have not seen the scaling fix yet. Parcels are composed of Parcel Segments. These are created when the Parcel was defined. They however can be estranged for various reasons, including half of the parcel was erased. We always (at least I hope always) work from the larger parcel inward to a smaller division. I have gone so far as to create a huge overall parcel in the background to help me when I knew the developer would add some land to the design later. I have a few of those that would guarantee that nothing will change later. It always changes. Say for example you have a small Parcel isolated within a big Parcel. Erase one of the sides to the smaller Parcel, and the contents bleed out to the larger one. No problem. However the remaining sides (Parcel Segments) of the isolated parcel are still there. The important thing to remember is that these belong to a Site. If you check the Segments, they are tagged accordingly. 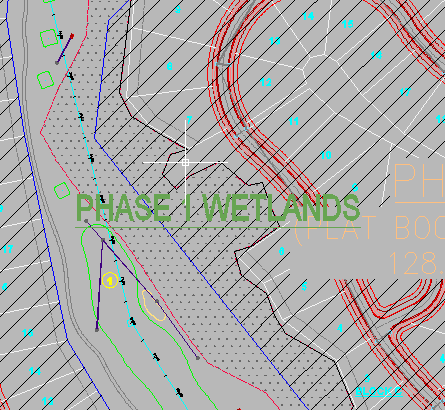 to remove land from the design and send it to the plat to the East. This Site was empty, so I erased it. Subsequently I erased the Parcel Segment I planned to work with. Undo!! The solution was to move the segment to the appropriate site. 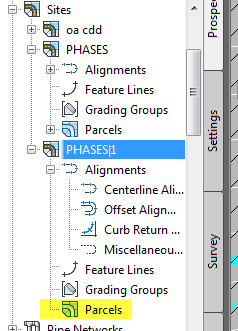 Use the context sensitive Ribbon Panel. I do love the Ribbon. 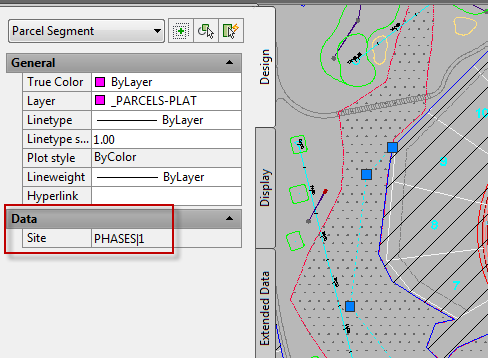 Once moved the Parcel automatically joins in with the others, and we change the style to match the adjacent plat. This could not have gone better. 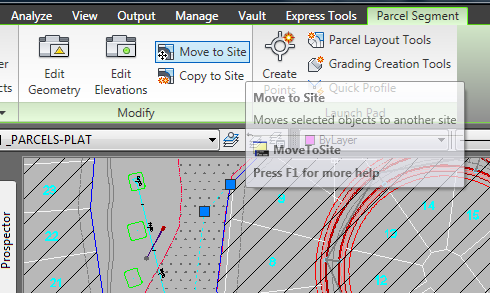 One of the keys to making Civil 3D fun is effective organization of your Sites and styles. Amazingly cool.